The SEAI Energy Show, now in operation for over twenty years, is the only multidiscipline all-inclusive business to business event in Ireland focused on energy efficiency and sustainable energy solutions. It takes place on 27th and 28th March 2019 at the RDS in Dublin and is a must visit for all energy professionals looking to network, learn, build business opportunities and experience the latest innovative technologies in the sector. As the broader economy improves, businesses are increasingly aware of the benefits of the sustainable agenda in achieving energy efficiencies, reducing their corporate environmental impact and making themselves more resilient in an uncertain future. 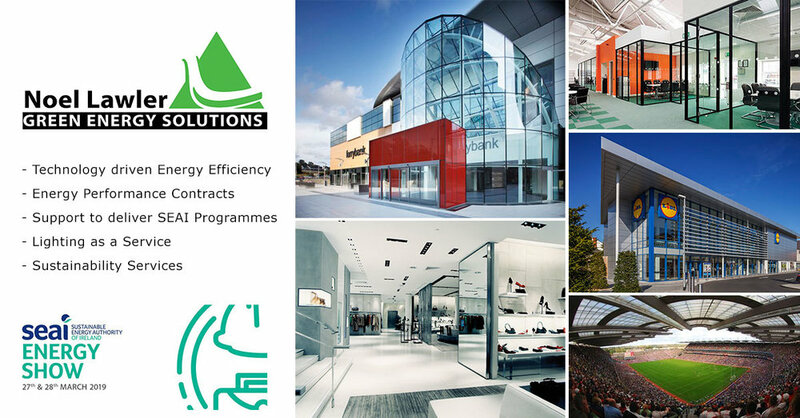 Green Energy Solutions team will be on Stand L6 to discuss our integrated approach to reducing energy consumption, carbon footprint and increasing sustainability. We offer consultancy and contracting services to clients in a wide range of industries looking to reduce energy costs, carbon emissions and develop energy strategies. We specialise in offering certainty to technical proposals by guaranteeing our savings. Our experts will advise on how to maximise the energy performance of your assets using an innovative approach to energy efficiency, the benefits of Energy Performance Contracts (EPC) and support organisations to deliver SEAI programmes such as EXEED, SME Lighting, Better Energy Communities and Project Assistance Grant. Our team has a wealth of experience in delivering comprehensive sustainability programmes, we can support you to develop your sustainability goals or offer advice on your existing sustainability agenda. Register for free tickets to the conference at https://confpartners.eventsair.com/seai-energy-show-2019/registrationpage/Site/Register. To arrange a meeting with our Associate Director, Charles Robinson anytime over the 2 days, email charles.robinson@nlges.com, call +353 (0)86 045 2621 or find us on stand L6.